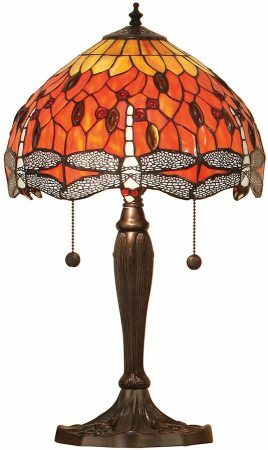 The Flame Dragonfly small 2 light 30cm Tiffany table lamp features a traditional take on the iconic Tiffany Dragonfly design in vibrant orange shades of highest quality art glass. Hand cut pieces of finest art glass are hand soldered using traditional techniques to create this complex Tiffany design. A wonderful 30cm diameter Tiffany table lamp, featuring deep burgundy glass beads, smouldering amber and golden orange hues. The dragonfly wings create the edging of the Tiffany shade with filigree wings and cool white tones. The dark bronze finish stand features a beautiful circular base and ridged column, fitted with two individual pull chain switches. The Flame Dragonfly small 2 light 30cm Tiffany table lamp, designed and manufactured by Interiors 1900.